HDF Sensor Brush — high-density fiber brush for sensor cleaning. 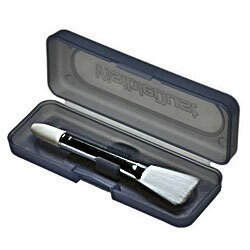 High-density Fiber (HDF) Head for Arctic Butterfly® 724 Sensor Brush® has been designed for extreme dusting. With its high density fiber construction, this accessory has twice the amount of fibers then the original Arctic Butterfly® attachment brush. High-density Fiber (HDF) Head for Arctic Butterfly® 724 Sensor Brush® is best used in excessively dusty situations. Includes a convenient carrying case for safe keeping.